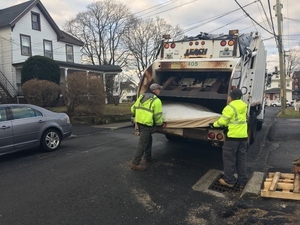 After a successful first year, the City of Norwalk is continuing its call-in bulky waste collection pilot program through 2019 with a few modifications aimed to improve the program. In 2018, the city rolled out the pilot program – where residents could call and schedule a curbside pick-up of bulky waste – for anyone who received city garbage collection. Before the pilot began, all residents were responsible for bringing bulky waste to the Transfer Station. Last year, the city made over 1,000 stops which resulted in more than 120 tons of bulky materials, metal, and plastic being collected. Residents who receive city garbage collection can request up to three collections per year. Items such as mattresses, box springs, couches, and carpets can be picked up. Certain items, like construction materials, hazardous waste, Freon appliances, tires, and motor vehicle parts are not permitted. A full list of what can – and cannot – be disposed of through the bulky waste collection is available online. To request a collection of bulky items, residents are required to call Customer Service at (203) 854-3200 ext. 4. Requests can be placed anytime up until 4:30 p.m. on the Monday before their scheduled collection; and if a holiday falls on the Monday, until noon on Tuesday. Bulky waste collection occurs monthly except in November due to leaf and yard waste collection. If a collection is canceled due to inclement weather, the collection will be postponed until the following month. To view map of zones and collection dates, visit www.norwalkct.org/BulkyMap.